One of the best bumper stickers I ever saw was on a red Chevy truck in Northern California about 15 years ago: it read, “In case of Rapture, this vehicle will be unoccupied.” That slogan came to mind following the uncanny confluence of God and Mammon in America in recent weeks. 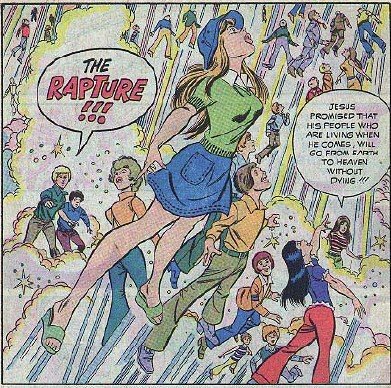 First we got a Vice-Presidential candidate, Sarah Palin, whose Pentacostal faith includes belief in the Rapture, in which God takes all the “elect” (those “saved” by belief in Jesus Christ) into heaven, leaving behind the “unrighteous” to suffer the throes of the world’s end. Next we got hit with the Economic Apocalypse, in which some of the “elect” (like A.I.G.) got raptured into the heavens of solvency, while the rest of us have been left behind to gnash our teeth and rend our garments, tormented by a plague of foreclosures and bankruptcies. Coincidence? You decide. Living as an expat in Germany, I get a lot of questions about Americans’ behavior. Most recently, I’m being asked why we accept the selective bailout of some failing businesses—many of which have appear to have brought about or hastened their own demise with irresponsible debt—while the vast majority of us will receive no assistance at all. It seems particularly galling to these European observers that our political leaders scold us for our bad financial habits, then turn around and use our tax dollars to bail out firms whose risky borrowing and lending practices are incomparably more destructive than our own. Those are usually the same politicians who voted to stiffen the penalties for individuals declaring bankruptcy, and who wouldn’t dream of supporting “socialist” programs like a national healthcare system, but who are all too ready to socialize the debts of private firms. The Europeans I know ask: why aren’t Americans taking to the streets to protest this outrageous inequity? In answer, I can only refer them to one of their own best thinkers, the late German social scientist Max Weber. Almost a century ago, Weber had a revelation of sorts about the connection between the near-simultaneous rise of Protestantism and capitalism in 16th century Europe. His theory, sketched out in “The Protestant Ethic and the Spirit of Capitalism,” suggested that among the unintended consequences of writings by Martin Luther and John Calvin were the spiritual legitimation of profit and the release of individuals from the moral obligation to share their wealth. In fact, believers in predestination came to see material prosperity as a signal from God that they were among the saved: after all, they reasoned, God would hardly allow the elect to suffer privation during their time on earth if they were destined to spend eternity in the many mansions of the Father. While these beliefs may seem anachronistic, they are deeply embedded in American life, particularly in the way we think about fairness and the distribution of wealth. The Puritan colonists were fervent Calvinists, and the institutions they and their descendants established became the basis for our nation’s financial and legal systems. They also created the templates for today’s “culture wars,” which aren’t just about abortion or gay marriage, but about who deserves to be “saved” economically. The conflict we’re seeing now is just the most recent engagement in a long national struggle. During the Gilded Age of the late 19th century, notions of Social Darwinism became popular by updating the Puritan perspective with a pseudo-scientific twist: arguing that Nature, rather than God, created the rich and the poor through a process of “natural selection.” That is, wealth was a reward for superior genetic fitness, while the biologically “unfit” were condemned to poverty. But while this theory shifted the source of socio-economic division from God to Nature, and redefined the defect as biological rather than spiritual, the result was the same: the poor were still “undeserving” of any help. It’s interesting to note that the “War on Poverty” 60 years later was led by the nation’s first Catholic President, John F. Kennedy. This history, in turn, suggests a legitimate policy reason for Americans who support the separation of church and state to care about the religious beliefs of candidates for the nation’s highest offices: their faith will shape how they perceive the distribution of wealth, including the provision of government aid to businesses and individuals in financial distress. With the economic End Times upon us, and the election just six week away, we’re awaiting a new answer to an old question: Who among us will be saved this time, and who left behind?